Phillips Collection curator Eliza Rathbone says Renoir was "at the height of his powers" when in he painted Luncheon of the Boating Party. In 1880, Pierre-Auguste Renoir, age 41, wrote to a friend that he was in a riverside town near Paris painting oarsmen. He'd been "itching" to do it for a long time: "I'm not getting any younger," he wrote, "and didn't want to defer this little festivity." Now that painting, Luncheon of the Boating Party, is the star of a new exhibition at The Phillips Collection in Washington, D.C. The painting shows 14 young people having a wonderful time on a sunny balcony overlooking the Seine. Lunch is over — there are half-full wine bottles, golden grapes and pears on the white tablecloth — and now they're relaxing, talking and flirting. "I really don't know any painting in Renoir's work that surpasses the boating party," says Phillips Collection curator Eliza Rathbone. "He's at the height of his powers. Renoir has really been painting in an impressionist style for more than a decade, and he's ready to surpass himself." The artist asked friends to pose for him — pretty models, actresses, a wealthy painter, the restaurant's owner — but they probably never posed together. "I think it was a logistical challenge bringing 14 people together," Rathbone says. "We doubt he ever did quite that." The Phillips show explains how Renoir got them all onto his large canvas — because they weren't all cooperative. "One he found so impossible he had to dismiss her from the project," Rathbone says. X-rays and infrared tests show that Renoir scratched her out and painted someone else in her place. His new, lovely substitute sits a bit apart on the left, in a straw bonnet with red flowers. She's wearing a blue dress and nuzzling an adorable little dog. She's based on a 21-year-old country girl named Aline Charigot. Charigot was a waitress in the creamery across the street from where Renoir lived. She hadn't known him very long when she posed for Luncheon of the Boating Party, but he had fallen for her and they became an item. "I think that's why she has the role that she does in the painting," Rathbone says, "because you wouldn't ever be in any doubt which figure he was in love with. ... He's the only impressionist that does romance; he shows romance in his art." Charigot became one of Renoir's favorite models. She was also his lover, and finally his wife. Diagonally across from Charigot, farther back in the painting, another pretty woman stands between two attentive men. She also wears a flowered hat — black, to match her dress, which has white satin cuffs. She's thought to be Jeanne Samary, a famous actress. According to Rathbone, she had a big reputation, and it got even bigger when she became engaged to the son of a banker. The gossip columns were full of words about the engagement because his proper parents disapproved. In the painting, Samary covers her ears with gloved hands. "Perhaps she's trying to block out the gossip," Rathbone says. A brown bowler hat covers the head of another Renoir pal in the painting. The man, Baron Raoul Barbier, talks to a rosy-cheeked girl and sits with his back to us. He had served as the mayor of Saigon (France ruled Vietnam in those days), but in 1880 he lived near the restaurant and stored Renoir's big canvas at his home. For 16 months, Renoir traveled back and forth from his Paris studio to the restaurant in Chatou to work on the painting. During that time, according to Renoir biographer Barbara Ehrlich White, he had a bad accident. "He fell off a bicycle in February of 1880 and he broke his right arm — and he was right-handed." After the accident, the intrepid artist put brushes in his left hand and kept right on painting. The resulting canvas became his masterpiece. Luncheon of the Boating Party is the center of The Phillips Collection show (up through early January). It's surrounded by paintings of and by some of the other folks at that long ago lunch — a delightful reunion of art and discoveries. Nicole Cohen adapted this story for the Web. In 1880, the artist Renoir wrote a friend that he was in a riverside town near Paris painting oarsman. He'd been itching to do it for a long time. "I'm not getting any younger," the 41-year-old artist wrote, "and didn't want to defer this little festivity." Well, NPR special correspondent Susan Stamberg says that painting, "Luncheon Of The Boating Party," is the star of a new exhibition at the Phillips Collection in Washington. SUSAN STAMBERG, BYLINE: It's the only painting I've ever wanted to be in - 14 young people on a sunny balcony overlooking the Seine, having a wonderful town. Lunch is over - half-full wine bottles, golden grapes, pears on the white tablecloth. Now they're relaxing, talking, flirting. 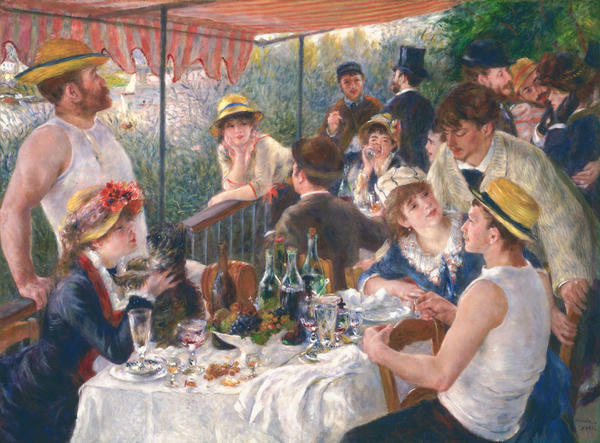 ELIZA RATHBONE: I really don't know any painting in Renoir's work that surpasses "The Boating Party." STAMBERG: Eliza Rathbone curated this show. RATHBONE: He's at the height of his powers. Renoir has really been painting in an impressionist style for more than a decade, and he's ready to surpass himself. STAMBERG: He asked friends to pose for him - pretty models, actresses, the wealthy painter Caillebotte in the sleeveless T-shirt for rowing, a man in a top hat, the guy who owns the restaurant where they're lunching. They probably never posed together. RATHBONE: I think it was a logistical challenge, bringing 14 people together. We doubt he ever did quite that. STAMBERG: The Phillipps show explains how Renoir got them all onto his large canvas. Not all his models were cooperative. RATHBONE: One, he found so impossible, he had to dismiss her from the project. STAMBERG: And scratched her out and painted somebody over where she had been. STAMBERG: X-rays and infrared reveal the 19th-century scratch outs. Renoir's new and lovely substitute sits a bit apart on the left in a straw bonnet with red flowers, a blue dress, nuzzling an adorable little dog. It's a 21-year-old country girl named Aline Charigot. BARBARA EHRLICH WHITE: She was a waitress in the creamery across the street from where he lived. STAMBERG: ...Barbara Ehrlich White, author of "Renoir: An Intimate Biography." Aline hadn't known Renoir very long when she posed for "Luncheon Of The Boating Party," but he's fallen for her. She's pretty in pink, and plump. They'd become an item. RATHBONE: I think that's why she has the role that she does in the painting because you wouldn't ever be in any doubt which figure he was in love with. WHITE: He's the only impressionist that does romance in his art. STAMBERG: Aline became one of Renoir's favorite models - also, his lover - finally, his longtime wife. Diagonally across from Aline and farther back in "Boating Party," another pretty woman stands between two attentive men - another flowered hat - black - to match her dress. She's thought to be Jeanne Samary, a famous actress. RATHBONE: She had a huge reputation. STAMBERG: ...Which had grown huger that summer when she got engaged to the son of a banker. RATHBONE: And all the gossip columns in the paper were full of it. STAMBERG: ...Because his proper parents disapproved - not our class, dear. And there's Jeanne in the painting, covering her ears with gloved hands. RATHBONE: Perhaps she's trying to block out the gossip. STAMBERG: A brown bowler hat covers the head of another Renoir pal in the picture, a man talking to a rosy-cheeked girl. He sits with his back to us. STAMBERG: Barbier had once been the mayor of Saigon. France ruled Vietnam in those days. Now he lived near the restaurant and stored Renoir's big canvas at his home. For 16 months, the artist traveled back and forth from his Paris studio to the restaurant in Chatou to work on the painting. And somewhere in there, Renoir had a bad accident. WHITE: He fell off a bicycle in February of 1880, and he broke his right arm. And he was right-handed. STAMBERG: But the intrepid Monsieur Renoir put brushes in his left hand, and kept right on painting and produced what became his masterpiece. "Luncheon Of The Boating Party" is the centerpiece of this Phillips show - it's up through early January - surrounded now by paintings of and by some of the other folks at that long-ago lunch. It's a delightful reunion of art and discoveries. RATHBONE: There's always something new to see, even when you're talking about a masterpiece that seems so well-known. STAMBERG: In Washington, I'm Susan Stamberg. (SOUNDBITE OF MILES DAVIS' "BLUE IN GREEN") Transcript provided by NPR, Copyright NPR.